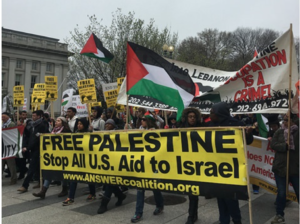 The ANSWER Coalition (aka ANSWER: Act Now to Stop War and End Racism) (aka International ANSWER) is an anti-American, anti-Israel, pro-North Korea organization associated with the Party for Socialism and Liberation. People's Congress of Resistance is a project endorsed by the ANSWER Coalition. March Forward! is "an affiliate of the ANSWER Coalition." ANSWER was "founded just three days after the September 11, 2001 attacks, ANSWER "has played an important role in the fight against racist and religious profiling, in support of immigrant and workers’ rights, and for economic and social justice for all. Our members are engaged in a range of struggles, from the local battles against police brutality to the international campaigns against militarism and war." "Founded just three days after the September 11, 2001 attacks, ANSWER (Act Now to Stop War and End Racism) initiated the massive U.S. antiwar movement opposing the U.S.invasion of Iraq in the months prior to March 19, 2003. "The ANSWER Coalition demonstration of 200,000 people on October 26, 2002, in Washington, D.C. ignited a nationwide and global antiwar movement that was nearly unprecedented in history. On January 18, 2003, 500,000 people packed the Mall in Washington, D.C. under the slogan “Stop the War Before It Starts.” The Washington Post described the January 18 demonstration as the largest antiwar protest since the end of the Vietnam War. "On February 15, 2003, many millions of people, in nearly every country in the world, joined together in the largest coordinated antiwar actions in history. "On April 12, 2003, just 3 days after the U.S. invasion force conquered Baghdad the ANSWER coalition organized a demonstration of 30,000 people in downtown Washington, D.C. under the slogan “Occupation is not Liberation.” This marked the beginning of a new stage of the U.S.antiwar movement which slowly regained its massive character as the resistance movement in Iraq made it clear that the occupation of Iraq would fail. "A distinguishing feature of the organizing principles and work of the answer coalition, in contrast with the traditional U.S.peace movement was its uncompromising support in defense of the rights of the Palestinian people. "In April 2002, the ANSWER Coalition organized the largest demonstrations in solidarity with the Palestinian people in U.S. history, of more than 100,000 people. "ANSWER, which at its core included a partnership between Arab and non-Arab activists, fought a long and successful battle against excluding the Palestinian struggle for self-determination from the anti-war and peace movement. In the years since, we have mobilized across the country to stop the repeated assaults against and massacres of the people of Gaza. "Most recently ANSWER lead a march of 50,000 people in Washington, D.C. on August 2, 2014 to protest the Israeli massacre against people in Gaza. "ANSWER has mobilized against the illegal coup and UN occupation of Haiti, against the illegal blockade of Cuba, and the illegal 'regime change' war on Libya. "We are actively fighting against the ongoing occupation of Afghanistan, the renewed assaults on Iraq and Syria, the drone attacks on Yemen, Pakistan and Somalia, among others. "In recent years, March Forward!, an affiliate of the ANSWER Coalition, has brought together anti-war veterans and active-duty service members to fight for their rights and oppose U.S. wars of aggression. "ANSWER has played an important role in the fight against racist and religious profiling, in support of immigrant and workers’ rights, and for economic and social justice for all. Our members are engaged in a range of struggles, from the local battles against police brutality to the international campaigns against militarism and war. "ANSWER Chapters are organizing in cities and towns throughout the United States connecting the flight for social justice at home and in opposition to war and occupation abroad." "It is time to stand up and with a clear voice say NO to the newest example of the “Monroe Doctrine,” which the U.S. government has used for over two centuries to repeatedly invade Latin America and Caribbean, control its politics and extract its resources. "The White House aims to overthrow the government of President Nicolás Maduro and replace him with Juan Guaidó. Guaidó is a U.S.-trained operative who was unknown to the vast majority of Venezuelans before he proclaimed himself president — at Vice President Mike Pence’s urging. Although Guaidó has the backing of Trump, the CIA, and the Republican and Democratic Party leaderships alike, huge numbers of Venezuelans have marched to reject this coup and defend their independence. "-NO to the coup — the U.S. does not have the right to select other country’s leaders! "-NO to the sanctions, oil embargo and economic war on Venezuela that is already causing suffering for ordinary people in the country. "-NO to military intervention and war from the U.S. and their proxies in the region. Medea Benjamin, CODEPINK; Reece Chenault, U.S. Labor Against the War; Will Griffin, Veterans for Peace; and Jill Stein, 2016 presidential candidate, Green Party U.S.A. The ANSWER Coalition is a member of the Task Force to Stop THAAD in Korea and End Militarism in Asia and the Pacific. A press release issued July 24, 2017 describes a U.S. delegation "[C]alling for the removal of the U.S. THAAD missile defense system from South Korea, an end to the U.S.-South Korea War Games in exchange for a freeze of North Korea’s nuclear weapons and missile programs, the replacement of the Korean War Armistice with a peace treaty, and the peaceful reunification of Korea, the delegation will share its message of solidarity with villagers of Seongju, Soseongri and Gimcheon where the THAAD interceptors are deployed, and with a broad spectrum of peace activists in Seoul." "The delegates are Medea Benjamin, CODEPINK; Reece Chenault, U.S. Labor Against the War; Will Griffin, Veterans for Peace; and Jill Stein, 2016 presidential candidate, Green Party U.S.A.
"Delegation coordinator Juyeon Rhee of the Task Force to Stop THAAD in Korea and End Militarism in Asia and the Pacific was blocked from boarding a plane at LaGuardia Airport in New York City on the morning of June 22. A protest campaign to demand that her travel ban be lifted is currently underway, with hundreds of organizations and individuals sending letters of protest to Moon Jae-In and the Blue House, including prominent peace activists like Nobel Peace Laureate, Mairead Maguire; Academy Award-winning director, Oliver Stone; and American author and Pulitzer Prize winner, Alice Walker. To add your voice, see www.StopTHAAD.org. "The delegation is sponsored by the Task Force to Stop THAAD in Korea and End Militarism in Asia and the Pacific and the Channing and Popai Liem Education Foundation. "The delegation will be hosted in South Korea by the National People’s Action to Stop the Deployment of THAAD in South Korea (NPA), a coalition of 100 civil society organizations. The NPA was formed August 2016 (expanding an earlier formation) with the goal of achieving the repeal of the decision to deploy THAAD in South Korea. "The solidarity statement of the delegation, “No to THAAD in Korea, Yes to Peace through Dialogue,” has the support of over 270 individuals and nearly 90 organizations, including well-known U.S. peace activists and educators Noam Chomsky, MIT; Daniel Ellsberg, Nuclear Age Peace Foundation; Chris Hedges, author/activist; Gwyn Kirk, Women for Genuine Security; Oliver Stone, Academy Award-winning director; Cornel West, author/activist; and Ann Wright, former U.S. State Department official, Army colonel, and member of CODEPINK. The organizational endorsements are also worldwide, reflecting a recognition that peace in Korea serves not only local and regional but also global interests. 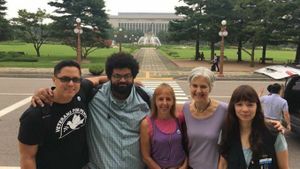 "Returning to the United States on July 28, 2017, the delegates have pledged to build solidarity in the U.S. for the struggle against the stationing of THAAD in South Korea and the escalation of militarism in Asia. The delegates further call on peace-loving people in the United States and globally to join in this effort." One of the major "anti-war" fronts of the Stalinist Workers World Party from the early 1990's through 2010, ANSWER sponsored many large protests over U.S. involvement in Iraq during both Gulf War I and Operation Iraqi Freedom, among other issues. Its leadership has consisted almost solely of WWP or Youth Against War and Fascism members, the latter group having changed its name to National ??? Youth. Over time, ANSWER has deleted from its website "www.internationalanswer.org" lists of speakers/participants and sponsors of its various protests but some have been saved (below). Since 2006 ANSWER has come under the influence of the Party for Socialism and Liberation, a split from the Workers World Party. Larry Holmes, Workers World Party’s first secretary, led a three-person, party delegation to the Democratic People’s Republic of Korea at the end of July, 2013. The DPRK was celebrating the 60th anniversary of the end of the Korean War. Ron Kovic - Vietnam veteran and author of "Born on the Fourth of July"
Medea Benjamin - Global Exchange a veterans supporter of communist fronts and cause including supporting Hugo Chavez, Fidel Castro, and Saddam Hussein. Founder of Global Exchange and associated with Code Pink, along with Jodie Evans. This page was last modified on 13 March 2019, at 03:16.